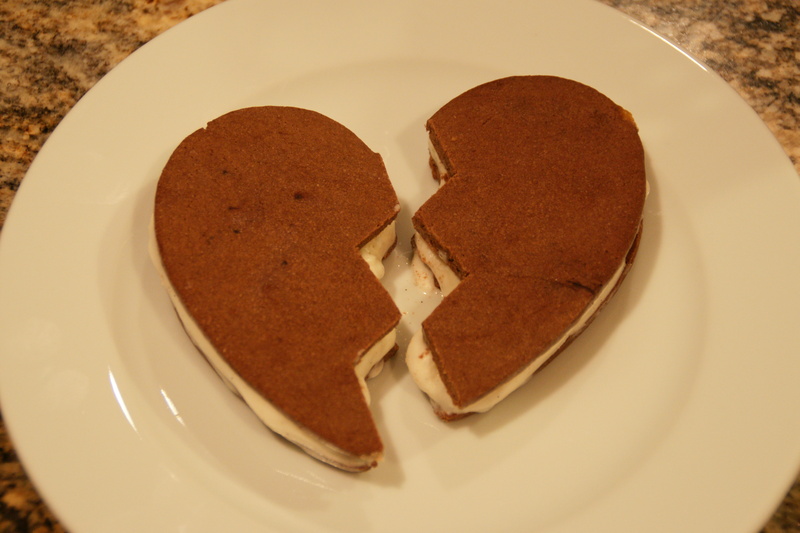 When Your Tween Hands You Lemons…Make Broken Heart Ice Cream Sandwiches! Remember those chocolate Valentine’s Day cookies my son Ken wanted for school? Yeah, the yummy ones from the Domestic Diva site. Well, yesterday morning, he refused to bring them in, citing “It’s weird, MOM! It’s OK for grade school, but I’m in MIDDLE SCHOOL now!” Seriously? What alien is this before me who also had the nerve to add that he never requested any cookies. (I swear I will need a multi-year script for Xanax to get through his adolescence)! I had defrosted 11 very large, very chocolatey heart-shaped cookies. They were still soft and very aromatic. I decided I would follow the Diva’s recommendation and make ice cream sandwiches. And I would NOT share with Ken! (I can be bratty, too). Since the cookies were so large, I stacked two a piece, flat sides together, and cut them in half, using a zig-zag pattern (the broken heart). They were soft and pliable, so there was no crumbling, and I had nice, clean edges– perfect! I used store-bought vanilla and mocha chip ice creams which I let soften a bit on the counter while I cut the cookies. I partly spread, partly mushed the ice cream on one side, then placed the other cookie on top and pressed lightly. Then I tossed everything onto a baking sheet and froze them for a couple of hours. Aren’t they cute? And very tasty. I will definitely make these for our summer party with our local frozen vanilla custard. Thanks for the tip, Domestic Diva (too bad you aren’t in Virginia to write me the Xanax script)! A broken heart that disappears…instantly! They are perfect for the ice cream sandwiches! Thanks for posting the recipe!